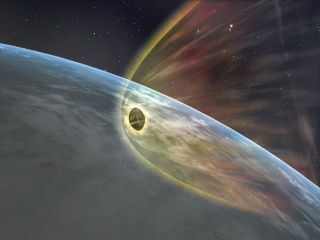 An artist's illustration of the sample-return capsule from Japan's Hayabusa asteroid probe, which returned to Earth June 13, 2010, from a seven-year mission. Ifa Japanese space capsule that recently returned to Earth is found to have collectedparticles from a billion-year-old space rock, it will join the short history oflucrative sample-return missions. ? Retrieving samples from space is considered more complicated, potentially more costly,and riskier than conducting remote or robotic expeditions, but successfulretrievals can confirm or disprove theories more accurately and can fuel oraccelerate decades of scientific research. Asresearchers and mission scientists await an analysis of what the plucky Hayabusa asteroid probe has brought back from space, they say previous sample-returnmissions have proven their usefulness. And, with improvements in technology andin methods of cleaning and sterilizing storage facilities, future missions to retrievesamples from Mars and beyond could provide even more valuable insights into theunknowns of our solar system. "Witha sample-return mission, you have a resource from which you can harvestinformation for generations," Michael Zolensky from NASA's Johnson SpaceCenter in Houston told Space.com. "It is much easier and more efficient to perform analyses on Earth thananywhere else." Zolensky,an associate curator for the interplanetary dust stored at Johnson Space Center,was a co-investigator for NASA's Stardust mission, the first to return samplesfrom a comet and from interstellar space. He is also a member of the sample-analysisteam for the Japanese Hayabusa mission. The Hayabusa asteroid probe plunged through Earth's atmosphere over part of theAustralian outback June 13, returning to our planet after a seven-year journey inwhich it encountered the asteroid 25143 Itokawa. Are-entry capsule containing particles was released from the probe about threehours before it plummeted to Earth. Hayabusateam scientists are now in the process of analyzing the particles to determineif they are from Itokawa. If so, the sample could shed light on two mysterious typesof cosmic objects, said Zolensky. ? "I'mvery optimistic, since these samples would forge the first direct link betweenmeteorites and asteroids," he said. Sample-returnmissions essentially began with the Apollo moon missions. Between 1969 and1972, six Apollo expeditions returned with a combined 842 pounds (382kilograms) of lunar rocks, core samples, pebbles, sand and dust from the lunarsurface. These samples were collected from six different exploration sites. Followingthe sample returns from Apollo 11 and 12, three Soviet robotic spacecraft ?part of the Soviet Luna program ? retrieved lunar materials totaling about three-quartersof a pound (300 grams) from three separate sites. ? NASA'sGenesis mission collected particles from the solar wind, providing the spaceagency with its first extraterrestrial sample since the Apollo program, whichended in 1975. Thegoal of Genesis, which launched in 2001 and crash-landed on Earth in 2004, wasto gather solar-wind atoms in order to analyze and measure the composition ofthe sun. Determining the sun's elemental and isotopic composition can helpastronomers better understand the chemical evolution of the solar nebula, whenthe planets in our solar system were being formed. The Stardust mission launched in 1999, prior to Genesis, but had a longer journey to itstarget, the comet Wild-2. Stardust encountered Wild-2 on Jan. 2, 2004, andcollected samples from the comet and interstellar space in a return capsulethat parachuted to Earth in 2006. Samplesare cataloged and preserved by curators at the Astromaterials Acquisition andCuration Office at Johnson Space Center. The curators also manage requests forthe samples' use. TheCuration Office currently holds five collections: Apollo lunar rocks and soils,meteorites from Antarctica, cosmic dust collected in the stratosphere, solar-windsamples from the Genesis spacecraft, and interstellar and cometary dust samplescollected during the Stardust mission. JudithAllton, curator of the Genesis solar-wind sample, stressed that sample-returnmissions are invaluable in providing scientists with the tools to yield accuratemeasurements and analyses. "Weget much more precise data off of returned samples," Allton toldSPACE.com. "You can have a sample and test it with differentstate-of-the-art instruments, and different teams can confirm or dispute theresults. People have been looking at the sun with remote sensing, but they'renot anywhere near close to the accuracy and precision that you can get with areturn sample." Zolensky,who works with Allton at the Curation Office, added that maintaining acollection of samples gives scientists the flexibility to test various ideasover the course of their research. "Withremote analyses, you only have one chance to get it right," he said. "With analyses in the lab, you can retry and refine analyticalprocedures." Scientistsalso say there are certain limitations to the measurements that are made remotely.A sample-return mission to Mars has the potential to produce findings that couldnot be made even on the surface of the Red Planet. "Thereare some things we can't do on Mars ? dating a rock is one of the criticalthings," Michael Meyer, Mars chief scientist at NASA Headquarters inWashington, D.C., told SPACE.com. "We know that water was a critical partof the planet's history, but we won't know for how long until we can date someof the rocks." Meyerhas been part of a longstanding effort to design a sample-return mission to Mars. Several attempts to jump-startthe project were met with lackluster support, but recent developments and an importantpartnership are cause for renewed optimism, he said. "We'vebeen working hard over the last year and a half to develop a joint Mars programwith the European Space Agency," Meyer said. "We've been wanting todo a sample-return mission for quite some time, and one of the things we'vedone through the years is gone through a learning process." Partof that process has involved coping with the enormity of the project. "It'sbig ? really big ? and everything is in one basket," Meyer said. "It's very expensive in any one fiscal year, so we've split it up intothree different segments. This spreads out the risk itself and spreads out thecost. It's kind of like making a down payment." Theproposal calls for a joint mission in 2016 to place an orbiter around Mars,followed by putting two rovers (one belonging to NASA and one belonging to ESA)on the planet's surface in 2018. The rovers will have the ability to collectand cache samples that can be sealed off in preparation for transportation backto Earth. Thenext step would involve sending a lander to the surface with an ascent rocketattached. A small rover would retrieve the collected material and bring it backto the rocket, which would then be launched into Mars orbit. Theorbiter would be dispatched to recover the sample and bring it back to Earth. "Bysplitting it up like that, we spread out the risk and each element becomesmanageable," Meyer said. "There are also other advantages, because ifone part of the process breaks, we can repeat it, and whatever step the sampleis in, it can stay there until the next step is accomplished." Anotherhurdle for a sample-return mission to Mars, and sample-return missions ingeneral, is the cost, said Meyer. This has been a subject of debate within thescientific community. "It'san expensive thing to do," Meyer said. "But there are huge advantagesto sample return. You get to interrogate the sample, and when you doexperiments here on Earth, you actually pick apart a rock and look at separateminerals. You can't do that on Mars." Curatedsamples can benefit future generations of scientific discovery, Meyer added. Astechniques for storing and safely preserving samples improve, researchers willbe able to refer back to these collected samples time and again. "Youcan revisit a sample, or a couple of years later, someone can go back andinterrogate the sample with a new approach," he said. "To be able tobring something back that has context ? it's sort of the Holy Grail. It's thegift that keeps on giving."